Mobile Suit Gundam: The Origin I Blue-Eyed Casval, which tells the story of Char Aznable, a popular character from Mobile Suit Gundam, was screened at the 28th Tokyo International Film Festival as part of a special program. 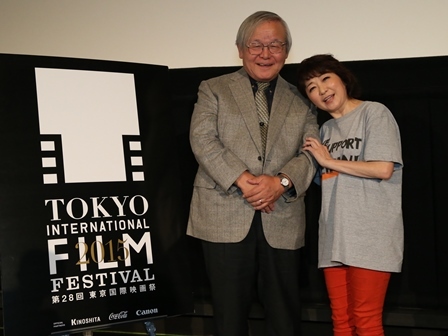 Voice actors Mayumi Tanaka and supervising director Yoshikazu Yasuhiko attended Shinjuku Piccadilly, Tokyo for a talk show. Supervising director Yasuhiko served as character designer and animation director of Mobile Suit Gundam, and turned the popular comic””Mobile Suit Gundam: The Origin”, which he himself developed, into an animation. This is the first story out of a series of 4 stories which tells the stories of the “Char and Sayla volumes” in volumes 9 and 10 of the comic. Yasuhiko and Tanaka, who did the voice for the main actor Casval Rem Deikun (later Char Aznable), have worked together on 3 projects, television anime White Fang (broadcast in 1982), Giant Gorg (broadcast in ’84), and the anime film Arion (released in ’86). Yasuhiko revealed that “I am a devoted fan of Tanaka’s.” About her casting, he said “I told casting supervisor director Fujino one thing- Casval has to be Tanaka”. However, Tanaka is also the voice behind lead character Monkey D. Luffy of the popular anime ONE PIECE. When Yasuhiko said that “Director Fujino was showing his disapproval on her saying ‘because Tanaka already has the mental picture’”, Tanaka was disappointed and said “You didn’t want me!”. And to the audience “But you like me, do you?” in a timid voice to which they gave their reply in the form of a huge round of applause. Yasuhiko added that the first moment he thought there was no-one else but Tanaka for the role was “when the mook Giant Gorg came out, and I saw an article on the dialog between Shuichi Ikeda in the role of Char, and Tanaka”, he confessed. “When I saw that, I thought, Tanaka should be Char. So the young Ikeda was Mayumi Tanaka” ”, he reflected, and the venue broke into laughter. Director Yoshiyuki Tomino and mechanical designer Kunio Okawara together with director Yasuhiko were once reputed as the “big three” that made up the golden age of Gundam. However Yasuhiko himself says that “I had given up on anime. Even now, I don’t think of myself as someone in the anime field”, he said. He also said of the period when he was at the forefront of animation production “in myself, I felt as though I was making anime in an empty way. In addition to that I didn’t have any talent, so I don’t have any good memories of my time in anime”, he reminisced, and went on to say “now, I am fulfilled to the point where I can finally really feel as though I am working in anime. Thanks to wonderful staff and cast, I can say I am satisfied with the current film, and the next one”, he revealed in a deeply emotional way, and the audience showered him with warm applause. Following this film, Mobile Suit Gundam THE ORIGIN Ⅱ: Artesia’s Sorrow will be screened as a special event for 2 weeks only at 15 cinemas across the country, starting October 31.